The Marmon Sixteen was a mighty titan among Depression-era automobiles. Few American cars could match the grand, tank-like quality and power of a Marmon Sixteen. 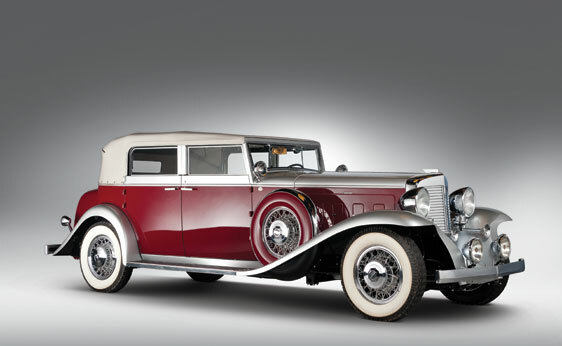 The model went on sale in 1931 – after Cadillac had begun selling their V16. You could buy a 16-cylinder Marmon until the company folded in 1933 and most of the 1933 models were leftover from 1932. About 400 Sixteens were built in total. The car has an 8.0 liter V-16 making 200 horsepower. It is mated with this wonderful bodywork – one of just 11 that survive in Convertible Sedan form. Ownership is known from new and the car was restored in 1985 before being added to the collection where it currently resides in 1993. What a car. RM estimates the sale price of this car between $400,000-$600,000. For the complete description, click here and to view the rest of the Milhous Collection, click here. This entry was posted in Uncategorized and tagged 1932, auction, car, classic, classic car, convertible sedan, marmon, RM, rm auctions, sixteen by classiccarweekly. Bookmark the permalink.